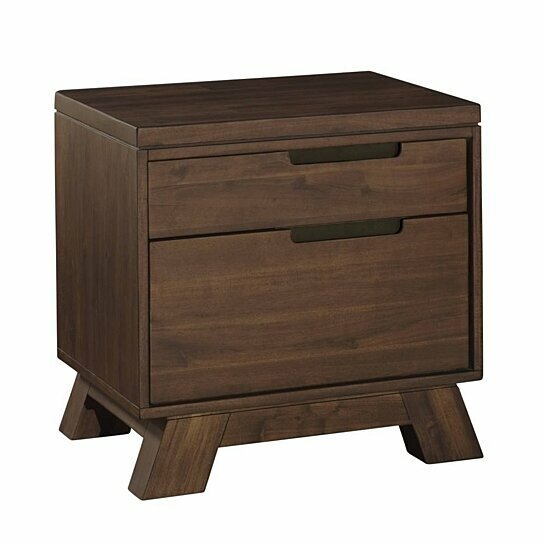 Wooden Nightstand with Two Drawers, Brown. For a quick modern update to your bedroom, this alluring Nightstand will add that trendy mid-century appeal that you are looking for. Crafted from solid butcher block Acacia wood, this piece sits atop a recessed base with thick splayed legs and is finished in a smooth, low-sheen walnut stain for a timeless, substantial effect. Its two drawer offers space for keeping remote controls and other accompaniments tidily tucked away, while its spacious top provides space for displaying your favorite bedroom accessories. Add this nightstand next to your bed to create an elegant and functional bedroom where you can truly relax. The nightstand rests atop a recessed base with thick splayed legs. The drawers of this nightstand will provide you storage space for keeping your remotes and other accompaniments tidily tucked away.